RodPrjónar: Today is a Great Day!!!! Today, exactly right now, as I am writing this post my DEAREST friend Laura is getting married in Asturias, Spain!! Today I woke up with this nervous feeling as if it was me who was going to get married! My stomach is full of butterflies for them both! I would have loved to be able to come to their wedding but they decided to have this just with their families and throw a party later this year... which of course I am not going to miss!! So, because of this GREAT occasionI I HAD TO knit something for the bride! I must say that the decision of what to make wasn't difficult at all. It had to be something delicate and beautiful. Anything better than lace? The pattern choice was also very easy... it had to be a Hyrna Herborgar for several reasons: it is my favorite pattern, it is the most beautiful shawl that I know (yes, I know, I am a bit obsessed with it!) and last but not least it is an icelandic design. * Pattern: Hyrna Herborgar (from the book Þríhyrnur og langsjöl). * Yarn: Cascade Heritage Silk (a mix of silk and merino). * Needles: 4.0mm and a 4.5mm hook to cast off. * As you many of you know this is not the first Hyrna Herborgar that I knit (if you want to see the other: one and two and three) This is actually the fourth one! So, knitting it was pretty smooth since I already know all the tricks of this pattern... and that helped me a lot because I was knitting against time! * This was the fist time I was using Cascade Heritage Silk. The yarn is amazing. It is a real pleasure to knit. The only boring thing was that I had to buy a WHOLE new skein just to make the crochet bind off row! And this yarn is not exactly one of the cheapest. Now I have a whole skein that I guess will become something for the baby of a friend that will be born in a few months. 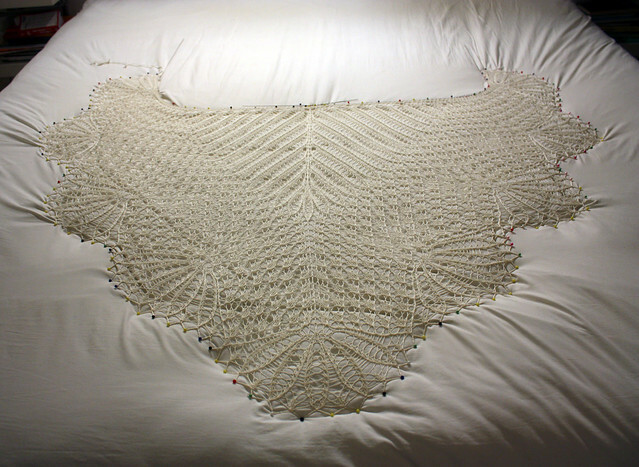 * Blocking this shawl is becoming easier and easier everytime! I was a little worried after blocking it because I found that the yarn had a little bit of "memory" ad it was shrinking a little bit on the borders. I had to use some steam to correct that. * Finally, I wanted to thank my friend Sif, who gently went out with me in a very cold (but amazingly beautiful) day to have some cool pics of the shawl. Fortunately the package arrived on time so Laura received her present! This morning, she sent me an SMS telling me that she was on the way to the church and that she was wearing the most beautiful shawl in the world!! I am so happy she liked it and most importantly that she is wearing it on this so very special day! Even though I am not physically there my thoughts are with them! All the best wished of happiness and prosperity for the newly married couple! Hurrah! Hurrah! Hurrah! y la tercera ya ha sido un coup de coeur, no me extraña nada que ya pases por el cuarto. les deseo los mismo días de felicidad que puntos lleva el chal. Si te animas, me avisas que yo te ayudo! Mi amiga Sif es un amor!! Y sabes? Ella es mitad espanola y mitad islandensa. Su padre es espanol. Ella es una de las pocas (si no la única desde que mi amiga Svanhvít se fue a vivir a Suecia) persona con quien puedo hablar castellano! Seguro que pronto tendré una foto de la novia con el chal... y muchas gracias por los buenos deseos para mis amigos! Qué bonito, queda genial, seguro que será una novia preciosa. Me encantaría tejer unos de estos con tus sedas! Estoy seguro de que quedaría PRECIOSO! I am sure that my friend was the most beautiful bride of the world today! She is not only beautiful but a wonderful friend! Sif is also a great friend of mine... as I mentioned above (in spanish) she is half spanish and half icelandic so we can speak spanish together (something that I don't get to do really often around here!). She was so sweet to go out with me... it was very cold but absolutely beautiful outside! (I am looking forward to hearing from you my dear Judi... but no rush :) My thoughts are also always with you!!). This is a pattern that I really recommend. 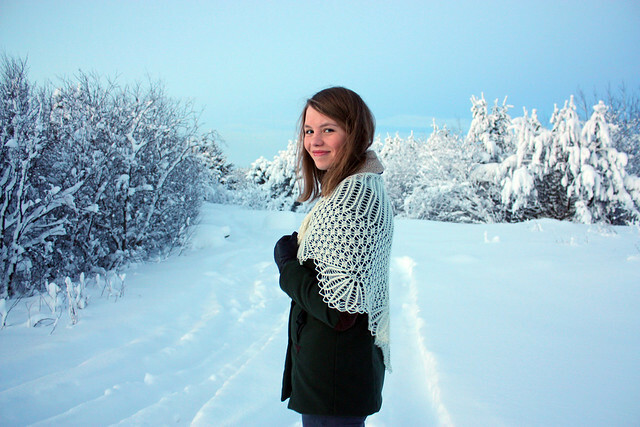 It is absolutely beautiful and it is a rather quick knit. He perdido el tiempo limpiando mi piso hoy, porque ahora está lleno de babaaaaaaaaaaaas. Jejejeje... gracias Albis! Se agradece toda la baba derramada, jeje. Jeje, qué bueno ser el culpable de haberte inspirado para empezar a tejer tan lindo chal! Espero ver cómo va quedando! Qué lana estás usando? Qué color? Rodrigo, que preciosidad de chal... no conocía el patrón y me he quedado anonadada. Por cierto, los calcetines los empecé por los dedos! Este chal es mi favorito... y por lejos! A ver si me animo algún día a aprender a tejer dos calcetines al mismo tiempo. Creo que sería la única manera de empezar a querer tejer calcetines, hehe. además de con tu maravilloso trabajo, me he quedado alucinada con el paisaje!, y tu amiga es guapísima! ^.^ qué bueno que tengas a alguien para poder hablar español...creo que debe de ser una de las cosas que más se eche de menos, no? un besote Ro! feliz domingo! Ro! Muchas gracias por pasar! El día que fuimos a sacar las fotos estaba espectacular... había tanta nieve! Y nada de viento! Parecía un cuento. En Islandia no hay muchos árboles pero Sif vive al lado de un bosquecillo (MUY ENANO) así que aprovechamos el momento y nos fuimos a sacar las fotos! Hablas castellano... sí, lo echo de menos a veces. Además hablar con ella es bien entretenido porque habla un espanol muy bonito! et oui il faut pratiquer l'espagnol , tu ne regardes pas la tv ? ou écoutes de la musique? Hello, again! :-) I received a wonderful comment from you on my blog and wanted to respond to thank you and answer your questions but it has "no-reply" on it and won't let me. Also, on your profile, where it says "contact"...it won't click. So, I thought I'd answer you here. I hope you don't mind. Anyway....Thank you for visiting and for such a nice comment. The shawl took me a couple of months but only because I was so busy with other things too. It would take longer than the other shawls I've done because it is more detailed and has a lot of single crochet rows and a LOT more stitches than the other shawls I've done. But, it could be made in a much shorter time. It was a lot of fun and I bet you could do it. Crochet is rather simple because the different stitches mainly consist of something like a yarn over and more or less of them or crocheting stitches together like a knit together stitch. I normally block projects right away too. This one just kept being set aside because my life was crazy busy for a while. Things are settling down now and I can finally play with yarn again. Yay! :-) Happy knitting! 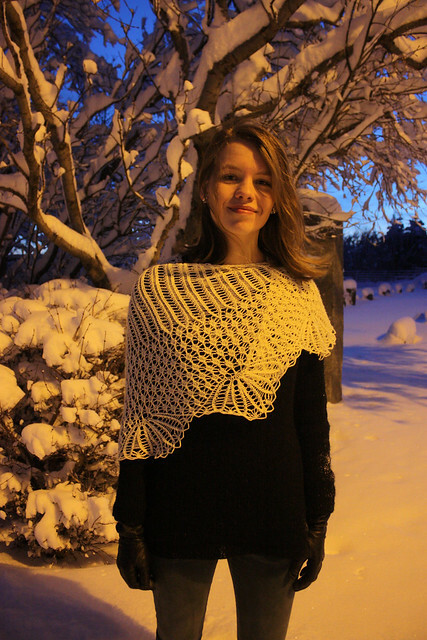 Wow - that's a fantastic shawl! Beautiful! I did not get married in Asturias, but went there for honey moon - it's a wonderful part of Spain. All the best to the marrying couple!! Oh, so you've been to Asturias! It is such a wonderful place! I really want to go back there sometime soon! Felicidades, espero poderlo ver usado por la novia. Las fotos de la novia... espero que pronto! Gracias Rodrigo, tomo nota, pero de momento tengo uno entre manos que cada vez que cambia de gráfico me quedo un poco atascada, ja,ja. Ánimo con la máquina de coser! Una vez que lo tengas hecho te vas a reír de de fácil que fue! El chal precioso, es una maravilla para un novia, y el paisaje espectacular,pero vaya frío que debe hacer !! Por suerte el chal llegó a tiempo, y justamente a tus tierras, aunque la boda no fue en Oviedo sino que en Peredo. Lo mejorde todo es que a la novia le encantó! Ya quiero ver las fotos de ella con el chal! Este chal es adictivo!! Y no es tan difícil como parece. Fotos de la novia... espero que pronto! We are looking at a cruise that comes to Iceland next year for 2 days - do you live near Reyjkavik? Your photos are gorgeous - but it sure looks cold up there! !I desperately want to visit - but I think I will come when it is a little warmer- LOL!! I absolutely LOVE your blog - I am now your newest and happiest follower! It makes me really, really happy that you liked my blog. It was so difficult to make the decision of making this blog (thinking that it wouldn't be interesting enough or that I wouldn't be able to keep it nice and updated...) but now after a few months I have absolutely no regrets about it! On the contrary... it has been a wonderful experience. A cruise stopping in Reykjavík for two days! That sounds great! I don't live in Reykjavík. I live in a small town called hafnarfjörður which is just 15 minutes away from Reykjavík. It is part of what is called the Capital Area (or, Höfuðborgarsvæði, if you want to know the icelandic word for it, hehe). Are you planning to come during summer? I would say that the best time for coming here is in June and July... there is day light all day so you have the chance to do A LOT (which is especially important knowing that you will spend only two days here). Thank you so much again! Now I am going to take a look at your blog! El que se ha emocionado ahora soy yo... muchas gracias por tu comentario. Mi amistad con Laura es uno de los tesoros más preciados que tengo... y bueno, como me encuentro un poquín lejos (aunque ahora mucho menos lejos que antes, cuando vivía en Chile) lo mínimo que podía hacer para ella era tejer algo para ese día tan especial. Muero de ganas de ver fotos!!! Hola Rodrigo, cuanto más veia tu hat mesi más me gustaba, así que casi estoy terminandolo,pero lo que empezó siendo un gorro para mi marido, pasó a ser mio, después del niño y ahora creo que la más pequeña de la casa es la afortunada jajaja. es que con los 120 puntos y la patente de punto retorcido es un poco estrecho así que tedre que hacer otro jajaja.Mi duda es cómo agrandar el patrón para poder usar lana igual (que tengo mucha).¿cómo lo harias tu? La verdad es que este gorro, Mesi, es bien adicitivo... queda tan bonito y con tan poco esfuerzo! Qué agujas estás usando para tejerlo? El patrón tiene una repetición de 30 puntos... entonces para hacerlo más grande o más pequeno debe sumar o restar múltiplos de 30. O sea, podrías montar 150 o 180 puntos para hacerlo más grande. MIde el gorrito pequeno que acabas de hacer para tener una idea de qué tamano quedará con los puntos que agregues. I received the shawl three days before the wedding day, opened the envelope and... well... tears running over my cheeks and a big big smile. 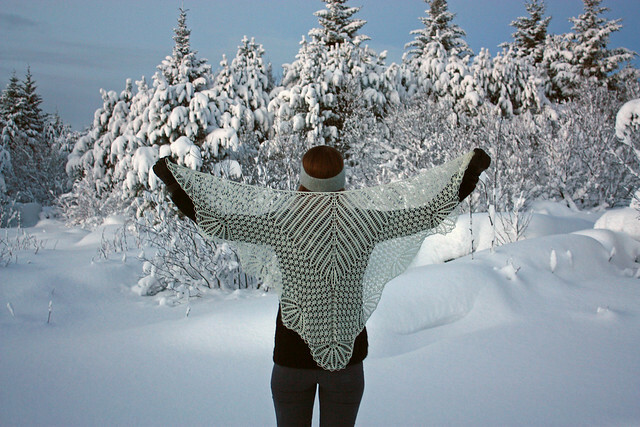 I can't say anything else about the shawl itself: you just have to take a look at the pictures. Just one thing: Rodrigo is the sweetest person I've ever known and the dearest friend I've ever had. The beautiful things he knits are just the translation of what it is inside his soul. We will always be there for one another. Thank you so much for the present, Rod (for all the presents, specially for the immaterial ones). Love. Recibí el chal tres días antes de la boda, abrí el sobre y... me empezaron a caer las lágrimas a la vez que me salía una gran sonrisa. No puedo decir nada más del chal: solo hay que mirar las fotos. Solo una cosa: Rodrigo es la persona más dulce que yo haya conocido nunca y el mejor amigo que he tenido. Las cosas tan bonitas que teje solo son la traducción de lo que tiene en su interior. Siempre estaremos ahí para el otro. Muchísimas gracias por el regalo Rod (por todos los regalos, especialmente por los inmateriales). Con mucho amor. Laura. No sé qué me gusta más, si el chal..., o si esas maravillosas fotos de Islandia..., (qué paisaje tan diferente al mío, hoy 22ºC)... La verdad es que lo que más me ha gustado es el cariño que desprendes en todas tus palabras... Sin duda eres un gran amigo de tus amigos!!! P.S. Estoy deseando ver a la novia con el chal!!! !